Over the years, it has become quite common knowledge that Nobu is simply one of the top destinations for truly fine sushi and Japanese-Fusion cuisine in San Diego. Located within the Hard Rock Hotel on Fifth Avenue, this is a hot spot for tourists, and the Gaslamp Quarter is always bustling with locals in search of a good meal. With more than forty sushi and sashimi options, in addition to a broad selection of specialty tempura, salads, special cold dishes, brick oven entrees, and many different hot dishes, including tobanyaki-style beef, vegetables, mixed seafood or tofu, the possibilities are seemingly endless. 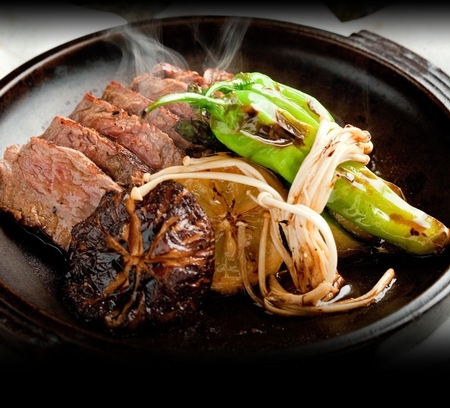 Tobanyaki, one of the more unique aspects of Nobu, is a cooking style which involves roasting the ingredients, usually premium beef, on a hot ceramic plate, radiating heat long after being removed from the ovens. Overall, the presentation is entertaining and produces quite tender morsels, full of flavor and piping hot. Once the main courses are gone, be sure to peruse the dessert menu for new, innovative creations that are sure to delight the taste buds and intrigue the mind. For those in search of a few pieces of sushi and a cocktail or two before committing to a large meal, Nobu also offers a superb Happy Hour menu featuring special prices on select sake, wine, beer and specialty drinks, the perfect precursors to a delicious dinner. To all who appreciate the authentic experience of fine Japanese dining and hospitality, add Nobu to your list of things to do in Downtown San Diego. Since the opening of his first restaurant venture in Lima, Peru, Chef Nobu Matsuhisa has spread his unique, multi-cultural cuisine all across the globe. His name and his restaurants have become synonymous with cutting edge seafood creations and a seamless fusion of Japanese technique and Peruvian ingredients with astounding results. Co-founder, partner, and long time friend of chef Nobu, Robert De Niro was one of the first to encourage the idea of spreading his talents to New York, and from that time forward, Nobu has become an international success with a myriad of locations worldwide. 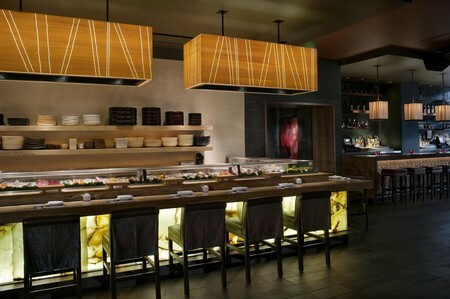 In 2007, the duo along with fellow partners opened the doors of Nobu San Diego on the ground floor of the Hard Rock Hotel. Just steps from the San Diego Convention Center, right around the corner from Petco Park, the Hard Rock provides the perfect location for yet another successful venture, and this evening, I am excited to discover what sets this restaurant apart. I meet my guest just outside the hotel after parking in the ACE lot at 6th and L Street. The walk from the car is short, and pay lots like this one are convenient when street parking is especially crowded, but there is always the valet available at the hotel when needed. As we step through the entryway into the Hard Rock, the casual vibe is immediately apparent, from the attire of the hotel’s staff to the wall of memorabilia collected from different celebrity guests over the years. 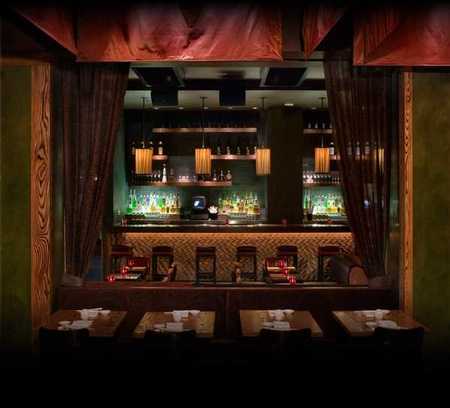 Just to our left, a swinging glass door leads us inside Nobu, and the smiling host quickly confirms our reservation. It’s early, so we request a seat near one of the large windows looking out at the huge Gaslamp Quarter sign, arching over 5th Avenue. As we walk toward the back of the spacious dining room, I observe the lounge to my left and the sushi bar to my right. The lounge is bustling with people, no doubt taking advantage of Nobu’s daily Happy Hour specials. The fully-stocked bar has seating for ten, providing the best view of various sporting events playing on large televisions, and there are several plush couches with small tables for relaxing with a cocktail. The sushi bar is equipped with available seating for up to thirteen, and several cheerful cooks are skillfully crafting orders in front of their guests, led by Head Sushi Chef Yuichi Matsuyoshi, or "Chef Matsu" for short. He appears to truly enjoy his work, which in turn makes those around him seem more enthusiastic, a definite plus when working with nearly twenty different recipes on the sushi menu at any given time. Heavy influences from South American ingredients, combined with traditional Japanese preparation methods, are the ways Chef Matsu creates “Nobu-Style” sushi rolls, unlike those of any other Japanese restaurant. To quote Nobu himself, “It's firmly based on Japanese cooking - fundamentally sushi - but with North and South American influences. My style.”The diners are obviously enjoying themselves, and it is no wonder why seating at the sushi bar is in high demand with such unique creations being prepared before your eyes. Our host leads us through the sea of tables, some round and others square, to a rather large booth with a clear view of the passing people just outside. He quickly offers us something to drink, so each of us order plain ice water with lemon, which is served in a stem-less wine glass. For those who prefer bottled water, Nobu offers still Fiji and sparkling VOSS as well. We are soon greeted and welcomed by General Manager Yaz Nakaue, who seems excited about our visit and introduces us to our server for the evening, Alex. Both of them are all smiles, and we just can’t help but smile back as they briefly explain the menu. Alex is sharply dressed in all black, as are his fellow servers, and he obviously knows a lot about the food here. The menu is pretty expansive, featuring well over one hundred dishes. 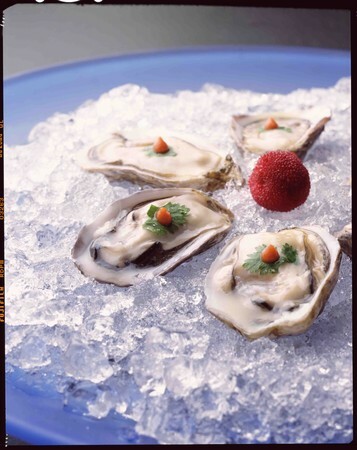 There are Special Cold Dishes like the Nobu Style Sashimi Tacos and the Octopus Carpaccio, as well as fresh salad selections including the Truffled Baby Spinach Salad and Lobster Salad with spicy lemon dressing. In addition, we find a long list of Special Hot Dishes with entrees like Steamed Chilean Seabass, Organic Chicken, and even Abalone, followed by specially prepared Wagyu beef to be cooked one of four different ways, each with a different, distinct flavor. Brick oven dishes such as the 30oz Bone-In Ribeye and Tobanyaki dishes, cooked on a large, hot stone, are followed by Specialty Tempura items including Live Octopus, San Diego Sea Urchin, and Mixed Mushrooms as well as four signature soups. The sushi and sashimi round up the dinner menu, featuring twenty six sashimi selections and eighteen different hand or cut rolls. It’s a lot to take in at once, and I begin to feel like it will certainly take time for new diners like us to decide what direction to take this meal with so many tantalizing options available. Picking up on the looks of indecision, Alex assures us that we need not worry about what to choose. 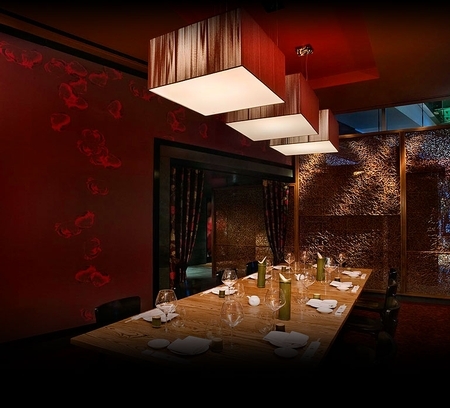 Yaz has arranged for us to experience a specialized meal, meaning that Executive Chef David Meade and Head Sushi Chef Matsu will have full selective freedom in preparing several courses to reflect the styles and flavors that are unique to Nobu. A very similar concept can be seen on the regular dinner menu. The Omakase menu, meaning “leave it up to the chef” is a somewhat more formal meal of the chefs’ choosing which typically features a few cold dishes and a few hot, as well as a flight of sushi and dessert for each guest. This option is always available for those in search of new and intriguing dishes, and it seems like a fun way to explore different styles and ingredients. I’m always up for a new culinary adventure, and to start us off, Alex recommends that we try a couple of hand crafted cocktails that are quite popular these days. He returns with one Cucumber Martini, garnished with lychee fruit and a petite slice of fresh cucumber, and one Mango Martini, garnished with a deep purple flower. 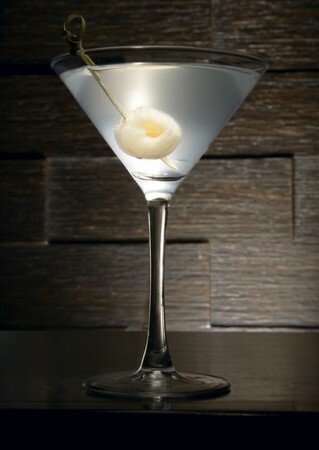 Served in a stem-less martini glass, the cucumber concoction is a pale green and very light to taste. I find it refreshing, with very little note of the alcohol. This is a winner in my book. In contrast to the shy cucumber, the Mango Martini is bright orange, with pronounced citrus flavors that completely mask any hint of vodka. The tiny vibrant flower blossom is a nice touch. Alex’s recommendations are spot on, and as we thank him, he presents our appetizer, a combination of vibrant green Edamame and Shishito Peppers, sprinkled with sea salt and served with two yellow lemon slices. We are each provided with a small dish for the empty pods and uneaten stems, and Alex tells us it’s best to squeeze the lemon over the entire dish. Doing so with no delay, I bite into one of the numerous warm shishito peppers. The bold flavor is slightly sweet, not spicy, and the zing from the lemon juice balances well with the sea salt. I deposit the remaining stem into my dish, and start in on the edamame. I like that I taste the salt and citrus first, before freeing the small, tender soy beans and transitioning to a smooth, starch-like consistency and mild earthy flavor. When our first course begins, all attention is on the new dish at the center of our table as Alex describes the three sashimi creations it holds. The presentation is colorful and efficient, individually plating two pieces of each variety down a long stone serving platter. 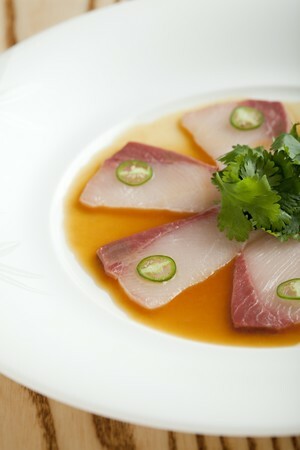 Beginning on my right, I scoop up the Yellowtail Sashimi, topped with slices of fresh jalapeno and cilantro. The filets sit on top of a yuzu citrus soy sauce, and the slightly sweet, salty mixture does well to balance the subtle spice of a single, small, round slice of jalapeno atop the fresh, tender fish. The cilantro lends the final lingering cleanse of my palate, making way for new flavors to come. Next, plated in the center of the dish is the Scallop New Style Sashimi with hot sesame and olive oil sauce. A hint of garlic and a sprinkling of small green chives add a splash of color against the pale meat of the large scallops, and the dark sauce is a stark back drop leading my eyes directly to the prize, so I waste no time. The sauce gives my scallop a very bold, roasted flavor, complemented by the pungent toppings. A true sign of skill in the kitchen, the soft texture and clean flavor of the meat are impressive and thoroughly enjoyable. To finish the dish, the beautiful red hue of lean Bluefin Tuna Sashimi is accented by the light green coloration of home-made wasabi salsa. A mixture of grape-seed oil, white onion, and garlic puree adds dimension to the wasabi, making it slightly mild, but don’t be fooled because this salsa packs a punch that stimulates the senses and heightens the salty, cool flavor of the high-quality tuna. The presentation of all three sashimi creations side by side is a brilliant display, and it’s refreshing to discover satisfying, innovative flavor combinations to match. Our second server notices our now empty plates and graciously clears away everything we have used, setting new plates for our next wave of oceanic delights and emptying our edamame receptacles. Taking a moment to breeze through Nobu’s wine list, I find over a hundred available by the glass, with a very good depth of international varieties including bottles from Italy, Spain, France, Australia, Israel, Japan, New Zealand, South Africa, and Austria. However, I am a bit more interested in the many varieties of premium Hokusetsu sake, which is exclusively crafted and imported for Nobu. While the Nobu Special Reserve and Nobu, The Sake from his own private stock are very tempting, I decide to pass, thinking of my drive home later and the martini I've already enjoyed. Moments after my decision, Alex appears again with the second course. 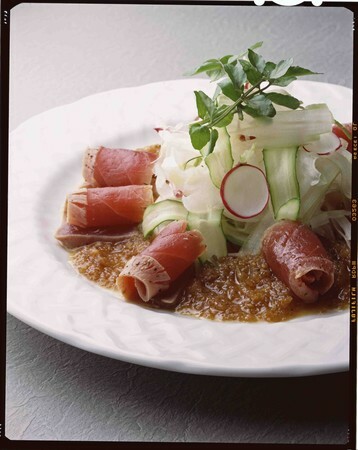 More artfully arranged than the first round of sashimi, the second dish is a large white square, also featuring three different selections which cascade from the top left corner down and across to the bottom right, with decorative garnishes of green and orange. The center servings are placed on two individual porcelain ladles, one handle crossed over the other, adding visual appeal and a convenient method for consuming the delicate morsels. I choose to start from the bottom, selecting a thin piece of White Fish Tiradito. Seemingly simple, the fish is spritzed with lemon juice, sprinkled with soy sauce salt then topped with a cilantro leaflet and a single red dot of rocoto chili paste. Alex explains that the rocoto chili pepper is native to Peru, and reflects just one example of the significant South American influences that are ever present in Nobu’s unique cuisine. These are the small details that truly make his food different, and the chili paste works almost instantly, spreading across my taste buds in preparation for the light, refreshing slice of fish. The meat is very tender, and the salty finish eases the lingering spice. I am a huge fan of chili peppers because of their versatility in the culinary world, and the White Fish Tiradito is a prime example of a successful experiment. Now I move to the Kampachi Sashimi at the center of the dish, topped with shaved baby artichoke that has been tossed in a light dressing, as well as small, crispy kataifi noodles. As mentioned previously, each serving is prepared in its own little ladle, along with a mixture of yuzu juice and olive oil for added flavor. I pick up one of the ladles and spoon the sashimi into my mouth with ease, no chopsticks required here. The kampachi is bolder than some of the other selections we have tried so far. 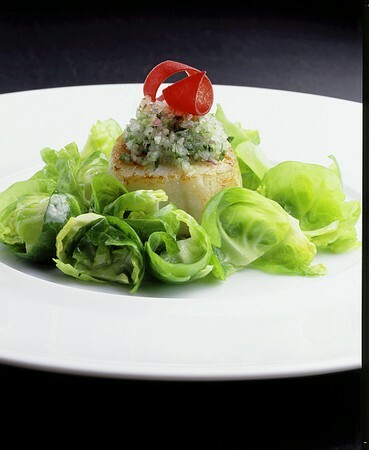 The artichokes are smooth and savory, while the kataifi provides a splendid crunch and mellow pastry-like flavor. The kampachi has absorbed much of the underlying sauce, making it juicy and a bit sweet, which suits this fish very well. Saving what appears to be the best for last, I set down my ladle and diver my attention to the remaining Seared King Salmon Sashimi, peppered and served over a mysterious, pale yellow Japanese mustard sauce. The pieces are much thicker than any of the priors, and I can see the fresh-ground pepper lightly coating the outer layer.The dark pink flesh is a sign of high quality, something Nobu strives for when choosing all of their ingredients, and the small green garnishes add a splash of contrasting color. Being sure to dip generously in the mustard sauce, per the chef’s recommendation, I enjoy the shifting balance of flavors that play across my palate. I first note the subtle smoky flavor created during the searing process, combined with the sweet and somewhat spicy attributes of the mustard sauce and pepper. The meat, being so thick, requires a bit more chewing than most sashimi, which allows time for the added flavors to fade so the salty, fresh salmon can speak for itself. This is my favorite of the six we have tried so far, and to complete the dish we cleanse our palates with a few bites of yamamomo, a small Japanese mountain peach. Alex tells us we have one more sashimi to try, but this time it will not be fish. Instead we will have two ounces of the seared Wagyu Beef New Style Sashimi. Within minutes it arrives featuring ten thinly sliced pieces of deep red meat, dressed with ponzu sauce and fanned out around the center of a decorative white plate. At the base of the fan, pale slices of ginger and stark white, shredded daikon radish surround a bed of finely chopped green scallions, garlic, bright orange daikon radish mixed with red chili, and a single round slice of lime, tucked into a leafy garnish. When viewed from the right angle, the dish reminds me of a colorful peacock, fanning its extravagant feathers in an impressive display of vibrant beauty. To my delight, the highly marbled premium beef tastes even better than it looks. As I’ve become accustomed to throughout this meal, I make sure each piece of meat is accompanied by a small helping of each ingredient. The radish is a bit spicy, yet balanced by the pungent garlic and sharp zing of fresh lime juice. The scallions are noticeable, but more subtle in flavor, while the ginger is present to renew the palate between each tender morsel. The searing of the beef is executed perfectly, just barely altering the raw coloration around the edges of each piece, and the salty sauce does not overpower the natural savory flavor of the meat. This is a dish that I would certainly be willing to try again, and I find myself wishing for just a few more bites. Alas, Alex removes the nearly empty plate and the manager, Yaz, approaches with a smile. We assure her that our visit is going quite well, and she shares her plans for a surprise addition to our dinner. Alex appears behind her with a heaping bowl, more colorful than anything we have seen so far. I recognize the long purple spikes of two large sea urchins; this is something I’ve never tasted before. Yaz explains that San Diego’s ocean fronts are prime real estate for more than just people. Sea urchins thrive here, and chefs from around the world recognize the superior size and quality of urchins harvested in this region. Being the adventurous soul that I am, I take a moment to admire the red, orange, green, purple and yellow arrangement sitting atop a bowl full of crushed ice, before selecting one of the two pieces. Unlike any other seafood I have experienced, the urchin “meat” literally melts like ice cream as it hits my tongue, and the taste of the ocean is so fresh it’s unreal. This is because the sea urchins are caught locally and little is done to them other than thoroughly rinsing away any foreign particles with clean water. Adding a bit of lemon here and a dab of wasabi there, I’m able to create several interesting flavors, and for those who love the taste of the sea, this is a ringer for sure. Veering back to the plan, we are now presented with two half orders of Nobu’s most popular Special Hot Dishes. 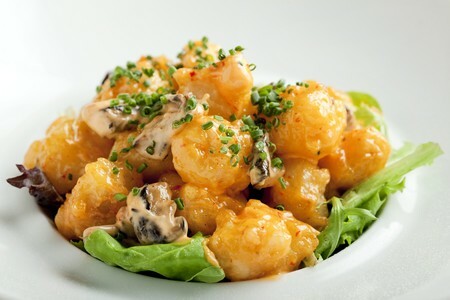 On one plate, we have the Rock Shrimp tempura, lightly breaded, fried, and tossed with a creamy spicy aioli and several chunks of mushroom. The shrimp are sprinkled with scallions and served over mixed greens with yuzu dressing. The orange shrimp seem to pop out against the leafy greens, and as I take my first bite, the loud crunch surprises me, because I expected the sauce to soak into the batter. Quite the contrary, the creamy aioli doesn’t penetrate the fried breading, and as I chew, I notice how tender the shrimp inside has become, much less chewy than expected from past experiences with other restaurants. I also begin to distinguish the spice and the subtle scallions, being sure to include a chunk of mushroom with several bites. This additional ingredient creates a good contrast in texture as well as a pungent, earthy flavor to calm the spicy, tangy sauce. Between bites, I utilize the mixed greens to clear my taste buds, so every bite is as delicious as the first. 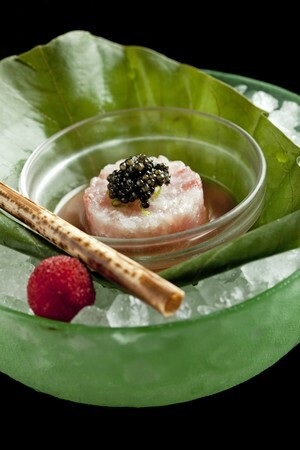 To accompany the shrimp, the second dish served in a shallow bowl features the “Nobu Staff Favorite” King Crab Tempura. Neatly stacked in the center of a pool of amazu ponzu sauce, I count four rather large pieces. Through the light brown, transparent sauce, I notice a generous helping of small jalapeno slices, added at the last second to provide just a touch of heat to the crab. The bright orange meat shows through the light, crispy breading, and to finish the presentation, a crown made of sliced red onion and cilantro leaflets, fit for the king of all crab. We are advised to break apart each delicate piece, allowing the tender meat to fully absorb the spicy ponzu. Meanwhile, I prepare for my first bite, combining a slice of jalapeno, a couple pieces of onion, and a sprig of cilantro on my fork. Though chopsticks are typically my utensil of choice for this type of restaurant, I admit that in this case, a fork and knife are much more effective for collecting several small ingredients for one bite. I skewer a hefty chunk of the now saturated tempura and slowly chew, enjoying each aspect of the respective flavors. The amazu ponzu has a sweet citrus bite that shocks my taste buds into action so that I can distinguish the spice of the jalapeno and the crisp, sweet onion from the juicy tender crab meat and the subtle crunch of tempura. The culmination of flavors is nothing less than mouth watering, and before we know it, another dish has been cleared of all edible material. One thing I truly love about Japanese seafood is the ability to try many different types without becoming terribly full. This is lucky for us, because Chef Meade has decided to add one more surprise of his own to the journey. He takes a moment to drop off a fresh batch of Oven Roasted Brussels Sprouts, so I seize the opportunity to pick his brain for a moment. After a few minutes of chit chat, he enthusiastically offers to prepare an unexpected dish that is more exclusive to the Downtown San Diego location, but doesn’t reveal which one he has in mind. So, with curiosity ignited I start in on the piping hot Brussels sprouts before us. 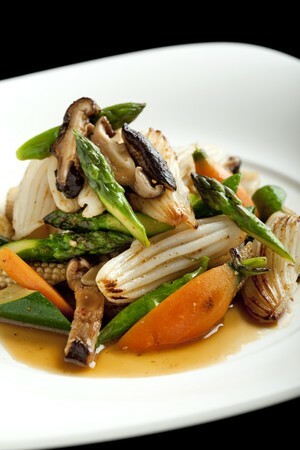 Dressed with yuzu truffle oil, dry miso, and grated parmesan cheese, these aren’t your every day serving of vegetables. Fresh from the oven, the pale green sprouts no bigger than gumballs are loaded with powerful flavors. The truffle is unmistakable, and its bold, unique flavor melds perfectly with the sweet citrus and creamy parmesan. Soft on the outside, yet still crisp on the inside, each bite tastes great, and the serving size is ideal for sharing between the two of us. Needless to say, we make short work of the small dish. 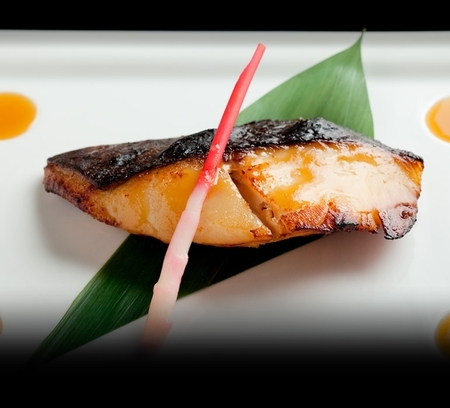 The time has come for the main course, possibly Nobu’s most signature recipe, the Miso Marinated Alaskan Black Cod. This large portion of white fish is marinated in a sweet miso sauce which is served on the plate alongside it. The filet sits atop a long green leaf, and a single stalk of light purple hajikami, or pickled ginger shoot, leans against it acting as a garnish and palate cleanser. It’s obvious that the marinade has been fully absorbed into the fish because the once white flesh is now a light tan, the perfect color match with the sauce on my plate. The skin is completely blackened, and once removed, reveals the tender, fragrant meat, bursting with sweet and salty flavor. As far as fishiness, cod is quite mild in my opinion, making it the perfect palette for a chef to experiment with. Fork tender, full of flavor, and beautifully plated, it is no wonder why the Miso Black Cod is Nobu’s most signature creation. Only now do I begin to realize how full I’m becoming, but we haven’t finished yet. Chef Meade returns with an elongated stone platter and presents the Live Soft Shell Crab Tempura, served over a base of mixed greens and marinated watermelon cubes. Intrigued, by the combination, I listen intently while he explains how the shiso amazu marinade only partially penetrates the watermelon, creating two distinct flavors that stimulate, and then refresh the senses in between helpings of the crab. However, it’s equally, if not more enjoyable to eat both at once. The crab is extra crunchy, with a hint of roasted sesame seed at the end. This is a drastic difference from the soft flesh of my watermelon, and I enjoy shifting from the juicy fruit to the crunchy tempura time and time again. Chef Meade seems delighted by our nods of approval, and tells us that each different Nobu location develops its own unique flair, because each chef gives a piece of their own philosophy and style to the restaurant they occupy. From just this brief moment of listening to him describe one simple dish, it’s obvious that his true passions reside in his kitchen, and it shows through his final products. With only dessert left to tackle, my friend and I are feeling quite content with our first experience at Nobu. The dining room, capable of holding upwards of 200 seated guests, is now filling up as the clock approaches 7:30 p.m. It’s amazing how quickly the time seems to have passed, and we take it as a sure sign that we’ve been having a good time. For the final hurrah, Alex lays out three separate desserts: the Bento Box, S’mores, and the Banana Soy Tobanyaki. Steaming hot, caramelized bananas with roasted pecans is a delicious combination which Nobu takes one step further by adding a large scoop of Malaga Sherry Gelato, made with sultanas, a “white” variety of grape. Very similar to bananas foster, the creamy gelato and sweet bananas mesh well, and the roasted nuts finish the Banana Soy Tobanyaki with a crunch. The S’mores consists of thick graham cracker panna cotta topped with chocolate fudge and four small mallows, along with a scoop of roasted marshmallow gelato over a bed of hazelnut crunchies. The two halves of the dish are connect by an additional streak of chocolate fudge, and it isn’t long before the rich delicate panna cotta and creamy, crunchy gelato mixture are completely gone. We even scoop the fudge off the plate, making chocolate the final lingering flavor of the dessert. This plays perfectly into the next. The Bento Box opens to showcase a small, flourless chocolate cake and a large scoop of green tea matcha gelato. The subtle gelato cuts the extremely rich cake, and the two combined flavors work well together. This light cake is a wonderful dessert, because although it’s not small, the lack of flour makes it less filling, and let’s be honest, who isn’t a bottomless pit when it comes to thick frozen gelato. While the S’mores plate was my personal favorite, gaining an edge with originality and creativity, the Bento Box dessert most certainly follows in a very close second. Having now reached the end of an epic journey through the culinary styles, techniques, ingredients, and recipes of Nobu, my friend and I take a moment to relax and observe the many different people still converging near the convention center, on their way to the Padres game taking place this evening. Impressed with the quality, and satisfied with the quantity, we briefly glance at the list of after dinner drinks, ranging from dessert cocktails and wines like the Espresso Martini or Kuramoto Plum Wine, to fine Cognacs and Digestifs. Deciding to pass on any further consumption, our table is cleared, and Yaz makes one last appearance before we bid her goodnight. Delighted that we have had such a positive experience, she assures us that she will extend our thanks to all who took part in the meal, from the attentive servers to the talented cooks, and specifically to Chef Meade for taking time to chat with us. Stepping out into the calm night air to begin the walk to our cars, I already know that I will be back for more of Nobu’s food. 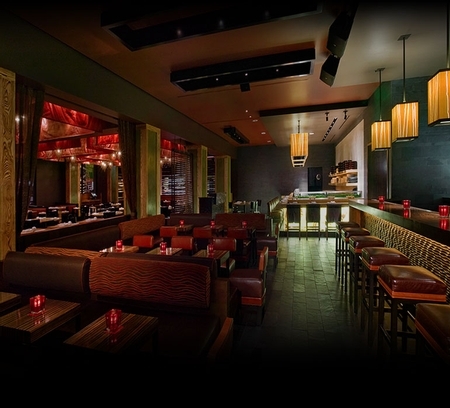 Insider Tip: Nobu San Diego is great for large parties, business dinners, and private events, especially with such close proximity to the Convention Center. Even when the restaurant's own private room is full, the Hard Rock Hotel can offer several different banquet rooms to accommodate your group. Corkage Fee: 30.00 | Per 750ml bottle. Main Dining Room | Bar 5 p.m. - 11 p.m.
Main Dining Room | Happy Hours 5 p.m. - 7 p.m.
Main Dining Room | Happy Hours 5 p.m. - 10 p.m.
Main Dining Room | Dinner 5:30 p.m. - 10:45 p.m.
Main Dining Room | Bar 5 p.m. - 11:45 p.m. I visited Nobu last night with two friends. The place is delightful to look at and had a nice ambience. Our reservation was for 9pm and we were taken to our table around 9:10pm. As I sat down, I felt something underneath me and reached down to the seat to find a cocktail tray on my seat. Our server came over and jokingly asked if we'd brought it with us. He was friendly and we ordered our food and drinks. He did not come back to our table until 11:00pm. In the interim a few different bussers/food runners waited on us. The portions of food were tiny (as expected, since Nobu in Vegas is the same), but of good quality. We finished around 10:30pm but chatted while we waited for our check. I finally made eye contact and signaled to him that we'd like our check. Another fifteen minutes went by and still no check. My girlfriend stood up to find him and the manager came over to ask us what we needed. She informed him we wanted our check. After another few minutes our server gave it to us. The bill was $172. We told him we were going to pay a total of $200 ($28 tip) and asked him to split it three ways between 2 credit cards and a $100 dollar bill. He brought back the 2 cards each charged for $66.66 and no change for the $100. My girlfriend went to ask him for the change. She came back and told us that she'd asked him for the change and he rudely asked if we weren't going to leave him a tip. If we let him keep the change it would have been a $62 tip! ($28 + $34). I asked her if he was going to bring the change and she said she wasn't sure. We stood up to go talk to the manager and I explained the situation. The manager seemd put-out with us for complaining about a tip as if we were bothering him even though the server was trying to rip us off. The manager finally issued us an annoyed "thanks for telling me" and basically dismissed us. Finally the server brought us the change. The server's name was William and the manager's name was Marbello(sp?). I will definitely NOT go there again. I luv to pass on a good word about fabulous food and wonderful places to eat, but last night was the worst experience. My friend and I set our sights on NOBU, "the world's most recognized Japanese restaurant known for its innovative new style". Well let me tell you....the only thing that was innovating was heading for the door after we got the check. This place was way over rated and over priced. They had people and tables crammed so close together that lady sitting next to my friend came pretty close to smacking him every time her LOUD French conversation got exciting...because she would start flailing around a bit....really. Did I cover everything.....over rated, over priced, horrible presentation, BLAND....o ya...if was freaking HOT, STUFFY and way to over crowed for the space NOBU lives in. So save your money......there are way better places to spend it...like Extraordinary Deserts....yummy ? chocolate & Hustler for pjs....super cute.? Needless to say our deserts were way better than dinner. The place is so overratted it isn't even funny. I felt like i was in a cafateria. The place is so loud u can't hear aross the table. Seating is terrible everone is cramed in like sardines u can hear everthing the table next to u is yelling. Food was terrible ordered $20 dollar sashimi plate got 4 thats right 4 peices of sushi and it wasen't even good fish. Server was ok. But food and atomsphere is terrible. Will never go to that overrated place again.